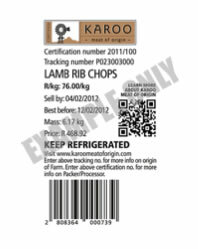 The Certified Karoo Meat of Origin certification mark guarantees the origin of Karoo meat. This document specifically deals with Karoo Lamb and Mutton produced and slaughtered in the Karoo region as defined herein. Only lamb and mutton originating from (that is, born in) the Karoo, will qualify. The name KAROO LAMB or KAROO MUTTON denotes the origin of sheep meat products and can be associated to carcasses, freshly packed or frozen meat or derivative products complying with these Standards. The code of production practices for Karoo lamb and mutton producers ties in very closely with the code of practice of good stockmanship and animal welfare, but includes specific practices to protect the origin identification of the product as well as to ensure the unique characteristics of the final product. The Karoo’s reputation is well attached to the principle of free range production. Animals should therefore have free access to natural veldt grazing, clean water and may have simultaneous free access to additional animal feed containing cereals, silage or any other natural plant matter but only provided as supplementary feeding (“byvoeding”) to assist during dry spells and to improve the condition of animals during the reproductive cycle. The Karoo name may not be attached to any animal originating from feed lots or that have grazed on lucerne or other planted pastures because this is not in line with the Karoo image of free range production and will not provide the sensory attributes linked to free range production. Likewise, animals that are reared on permanent pastures will also not qualify for the meat of origin label. It follows that animals must be reared predominantly on natural veldt for it to be considered Karoo mutton or lamb. The main focus of the Certified Karoo Meat of Origin scheme is to certify the origin of lamb and mutton as from the Karoo. The mark brings into play “origin based certification” but this origin – the Karoo – has a free range, wholesomeness and pristine identity. 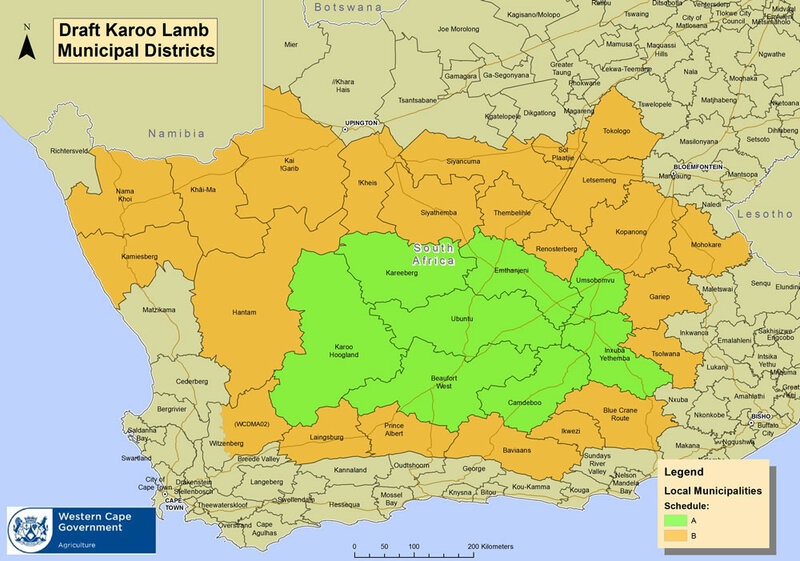 The Karoo region is defined with reference to local municipalities listed in Schedule A (below) and the lamb producers farming within these municipal boundaries qualify for use of the certification mark, provided compliance with the standards presented here can be shown. Schedule A comprises of local municipalities in which it was found that the following typical Karoo bushes occur naturally, constituting the predominant indigenous vegetation, namely, Plinthus karrooicus (“Silverkaroo”), Pentzia spinescens (“Skaapbossie”), Eriocephalus ericoides (“Kapokbossie”), Salsola glabrescens (“Rivierganna”), Pentzia incana (“Ankerkaroo”) and Pteronia glauca / Rosenia humilis (“Perdebos”). It has scientifically been shown that the reputation or distinctive character of KAROO LAMB mainly derives from indigenous veldt vegetation consisting of the said species. In addition the local municipalities listed in Schedule B (below) can also qualify as forming part of the Karoo region, but a prospective producer or farm is required to first be inspected by an independent certification body in order to verify that at least two of the identified Karoo bushes [Plinthus karrooicus (“Silverkaroo”), Pentzia spinescens (“Skaapbossie”), Eriocephalus ericoides (“Kapokbossie”), Salsola glabrescens (“Rivierganna”), Pentzia incana (“Ankerkaroo”) and Pteronia glauca / Rosenia humilis (“Perdebos”)] are present on more than 60% of the area of specified grazing camps on the specific farm in similar ratios to those encountered on farms situated in the local municipalities listed in Schedule A (below). In the spirit of defining the Karoo region as inclusive as possible, and given that the boundaries of the Karoo are never exact, it is also possible for farms located in local municipalities outside the demarcated region, but bordering the municipalities in Schedule B, to be classified as part of the Karoo. In such cases farmers should provide scientific evidence that the vegetation on the farm(s) in question resembles typical Karoo vegetation as for schedule B. This evidence should then be verified by an independent auditing firm to ensure that the farms can be certified as farms in the Karoo. Farmers will be expected to carry the costs of this auditing process but in the case of emerging farmers the KDF will subsidise the costs. In order to qualify for certification farmers need to provide evidence that their farms are located in the Karoo region as identified above. They also need to provide proof that they practice free range production systems on indigenous veldt and that animals are not grazing on permanent pastures. The reputation or distinctive character of the meat of the KAROO derives from free range grazing or production on indigenous veldt vegetation. Hence only lamb that feeds freely from indigenous veldt, in sizable camps representative of the identified typical Karoo vegetation, and that has access to clean water, qualifies for use of the name KAROO LAMB. The occasional use of additional feeding supplements that may contain cereals, silage or any other natural plant matter, provided as supplementary feeding (“byvoeding”), for example, to assist during dry spells and to improve the condition of animals during the reproductive cycle, may be allowed to a maximum of 30% of the total intake/ daily requirements. The supplementary feeding must be given while the animal is still grazing on the Karoo veldt?and roaming freely. Only registered brand names may be fed of which the composition is known to the farmer. It can consist of added minerals, urea, good quality hay and/or any other acceptable forms of supplementation. Feed not to contain any feedstuff known for excess heavy metal and pesticide disposition. Added antibiotics and other chemical additives (e.g. ionophores, etc.) are not allowed in the feed of any animal. During supplementary feeding, feed bins/troughs must be cleaned regularly, ensuring that old and damp feed is removed to prevent souring. Keep accurate written records of all supplementary feed, fed to animals on the farm. Lamb originating from feed lots (as opposed to free grazing) does not qualify for use of the name KAROO LAMB; free range grazing or production is a specific requirement as it is acknowledged as a contributing factor to the taste or sensory attributes of KAROO LAMB. Medical treatment, processing or any other form of examination. After completion of the first four processes, the animals must be returned to veld immediately. Farms must have well maintained handling facilities. The facilities must be well designed to ensure the easy flow of sheep through the facility. It must be free from sharp edges, corners and broken rails that may cause the sheep to injure them. Owners and managers should ensure that the sheep are monitored on a routine basis to assess the overall health of the flock. An animal health program must be in place and reviewed at least annually. Growth stimulants: All growth stimulants, either hormonal or anti-microbial and administered in whatever way to the animal, are prohibited. Anti- microbial drugs: The prophylactic (preventative) treatment with any anti-microbial drug is not allowed in this program. Camp stocking rates should be such as to ensure that the natural environment and general plant condition and density are not adversely affected (preventing over-grazing). Indigenous veldt must be rested (not be exposed to over-grazing) from time to time to ensure optimum growth and production (a planned and scientific veldt rotational system should be used). High pressure points (water troughs, lick bins, etc.) must be managed to minimize damage caused by trampling. Water sources must be capable of supplying sufficient amounts of cold, fresh and clean water to meet the requirements of healthy, grazing sheep. Water points should be clean and free of excessive mud in and around water troughs. Drinking troughs must be cleaned on a regular basis to eliminate the growth of algae and the deposit of waste feed and other contaminants. Transportation of live stock must be in accordance with the regulatory procedures laid down under the Animal Protection Act 71 of 1962. Trucks must not be overloaded and all vehicles must be well maintained and constructed with no physical protrusion, for example, hinges and latches are recessed, no bolts left protruding. Proper record keeping related to the movement of animals between farms or from farm to abattoir is also required. Animals may not be transported further than 250 km from the farm to the abattoir. The farmer delivers the animals and signs the “verwyderingssertifikaat”/ “ontvangsbewys” or similar document where it states that the animals are free range and conforms to the rest of the specifications for free range animals. Keep a copy of this document on file for auditing purposes. Animals, ready for slaughter, may only be removed from the farm if accompanied by a DECLARATION OF COMPLIANCE TO KAROO MEAT OF ORIGIN STANDARDS (Addendum 1). This form must be completed and signed by the producer (or an authorized person). The producer will keep a copy of the DECLARATION OF COMPLIANCE TO KAROO MEAT OF ORIGIN STANDARDS, while the other copy will accompany the specific truck to the dedicated abattoir. The abattoir will only accept animals for slaughter that are accompanied by a Declaration of Compliance. Keep this copy on file for auditing purposes. Abattoirs slaughtering animals for sale under the certification mark must comply with all the requirements for food safety and traceability. It is therefore expected that sheep will be slaughtered at abattoirs registered with the Red Meat Abattoir Association of South Africa and will have a HAS rating of at least 75%. It will be expected of the abattoir to supply the summary page of the HAS audit report to the auditor. This will be forwarded to KDF with the KMOO audit report. An important factor contributing to the quality of Karoo Lamb is the relative short distances animals travel to the abattoirs. Stress levels of animals are lower and in support of good animal ethics and animal health standards, animals should not be transported for more than 250 kilometres to an abattoir. Abattoirs also need to comply with food safety regulations applicable to the meat industry as well as The Meat Safety Act. In addition these role players must have an operational traceability system in place that has been approved by SAMIC, which competently verify the origin of carcasses and meat products in terms of these Rules. Added to this the abattoir needs to use the prescribed roller mark and meat stamp as more fully described later in the document. Only animals from certified farms will qualify to be sold with the certification mark. Breed Preferably meat breed types with good bone: muscle ratio with an even fat distribution. Tracking number: The animals should each receive a unique carcass number (tracking number), which must ensure full traceability to the live animal and the farmer. The identification mark must be visible at all times. All relevant information must be documented and recorded. At the point of carcass classification and weighing, a specific Certified Karoo Meat of Origin stamp and CERT KMOO roller mark must be rolled/ stamped on the specific carcasses. The only exception is when animals are slaughtered for in-store butcheries of retailers (Certified Natural as an example) operating under a KDF recognized and approved free range protocol. In this instance the registered rollermark for this specific protocol may be applied instead of CERT KMOO with the KMOO stamp on the leg. All Karoo Meat of Origin carcasses must be kept in a specific area of the chiller. Management shall ensure that all relevant staff has sufficient knowledge and training in meat hygiene principles and practices. Abattoirs must ensure products are safe, of consistent high quality and meet all legal requirements which include acts, regulations, compulsory standards, and local ordinances. The abattoir will issue a Certificate of Compliance with every load of carcasses. For meat packers and processors the standard is a traceability standard but forms the foundation for other quality, safety, hygiene standards as well as legal requirements. This standard is designed to be compatible with other more demanding food safety standards. All food premises must have a certificate of compliance from the local authority as required by the Food Premises Regulation R962. must ensure the products are safe, of consistent high quality and meet all legal requirements which include acts, regulations, compulsory standards, industry standards and local ordinances. is expected to do it under a clean and hygienic condition to ensure food safety, quality and to prevent foreign body contamination. Full traceability must be in place which verifies the origin of carcasses and meat products from farmers, abattoirs and meat processing plants. Only carcasses accompanied by a Certificate of Compliance (issued by the abattoir) may be used for Certified Karoo Meat of Origin purposes. 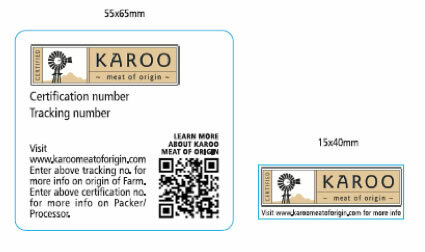 Certified Karoo Meat of Origin must be accurately represented on the packaging. Only carcasses from certified KMOO abattoirs/ certified KMOO packing facilities/distributors may be used under the KMOO certification mark. No audit will be done on the butchery prior to selling the product. If a carcass is cut up into primals, the butchery is responsible to be able to proof the abattoir of origin for the specific primal. use the full certification label but where the label reads tracking number it may be changed to abattoir number. This will be the certification number of the abattoir who supplied the meat to the butchery. It will then be possible for the customer to trace the meat back to the abattoir on the KMOO website. If a butchery wants to be able to track the lamb back to the farm the butchery needs to apply and be audited against the Packer/ Processor standard. In the event of any critical or unacceptable deviation from the KDF’s guidelines, certification will be revoked with immediate effect, and the relevant party would have to cease use of the Certified Karoo Meat of Origin mark with immediate effect (which includes removal of the Certified Karoo Meat of Origin certification mark from already marked products not yet sold, from menus or from advertisements). Once certification has been revoked, the relevant party will have to apply afresh for permission to use the Certification Mark; there is no automatic grant of a right to use the Certification Mark. In the event of a minor deviation, the KDF will issue a Corrective / Preventative Action Request to be complied with within a stated time frame, and will inspect or monitor compliance (at the licensee’s cost); failing in which case the licence will be revoked as in the case of a critical or unacceptable deviation in the foregoing paragraph. The KDF shall have the power to amend the rules and guidelines or any specifications laid down in terms hereof. The KDF will give due notice of any such amendments to affected licensees, and to afford licensees a reasonable time period for compliance with such amendments. a. The Certification Mark will only be used in connection with meat (mutton and lamb), regardless of breed, produced and slaughtered in the Karoo region as defined herein. b. Only animals originating from the Karoo, and which are free of scheduled diseases, herein referred to as Karoo sheep, will qualify for certification. c. The Certification Mark certifies the origin of the animals and that the appropriate Certified Karoo Meat of Origin standard has been conformed to. This includes compliance to a full traceability system in order to trace meat carcasses and freshly packed meat products, or derivative products, back to the farm of origin. d. Licensees may only use the Certification Mark in the manner registered and approved by the KDF. Any and all prospective uses or applications of the Certification Mark by licensees require the KDF’s prior consideration and approval. This implies, among other things, that any advertising, packaging, product labelling or any other manner of use must be submitted to the KDF for prior consideration and express approval. It has to meet minimum industry requirements, as well as any special requirements by the KDF as stipulated from time to time.